In an individual’s life, the challenge is the biggest part where a person could work and achieve success. There are different challenges in the lives of different persons. If you will face it, then only you could open new doors in your life, as there is no limit to the success. A student can work hard and struggle to achieve their desired goals and success in life. This challenge is accepted by the MBA (Final Year) student, Avinash Kumar from Arya College of Engineering and IT. He has chosen the real goal instead of following that regular trend of life. His journey of career from MBA to Nation’s Security paid him in the best way with full confidence. During his college days, he has appeared for Air Force Common Admission Test (AFCAT ) 2017 and Cleared it in the first attempt. Then, he went for AFSB (Air Force Selection Board) in Mysore (Karnataka) for 5 days interview process and cleared PABT (Pilot Aptitude Battery Test). But later in the same selection process, he got Merit-Out from All India Merit List. Also, he has appeared for Pre-Selection and Final Selection Board of Indian Coast Guard and got the selection on 21st December 2017 for the sister concern of Indian Navy as an Assistant Commandant, as he is still running in the graduation years, he has asked Indian Coast Guard for some extension so that he could clear his MBA Final Exams and confidently join the 2018 session in July. The main headquarters of Naval Academy is in Kerela. From the way of trial/Struggle to Success, he had conducted various workshops on the College Campus for Second, Third and Fourth year of Engineering students along with the First year of MBA students. According to Avinash, Arya College played a great role in his success by proving huge opportunities, platforms, and motivation. 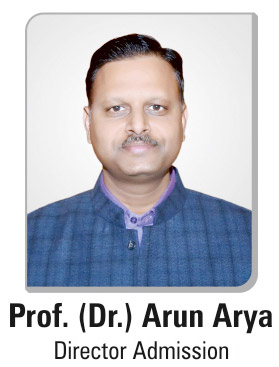 The Training and Placement Officer at Arya 1st Old Campus gave him the opportunity to showcase his communication and leadership skills by allowing him to conduct motivational and intellectual workshops and seminars. On this, he took 6 different sessions of the entire day. Also, he had shared his struggling journey with the students. Avinash believes that he could not have achieved this success without the proper guidance and mentorship of Akhil Pandey and Arun Arya Sir. The other college authorities have also helped him to find quality success for the entire life.